Jenna (P3), Aaron (P1) and Owen (Nursery)’s Uncle Matt was in Nepal during the recent Earthquake. He has been back in the UK speaking and fundraising to help the people of Nepal rebuild their country and he asked Taynuilt Primary to help the children of a school similar size to ours. Many schools were destroyed by the quake and everything was lost. They are trying to restart the schools but have no equipment at all. Matt asked if we could donate pencil cases and fill them with things the children will need- pencils, sharpeners, rubbers etc. 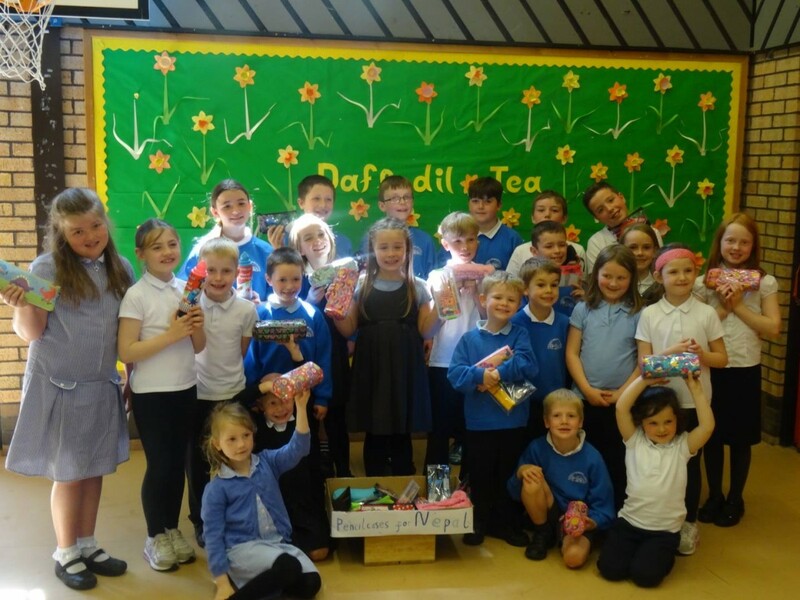 As always the children of Taynuilt generously rose to the challenge to help others who are not as lucky as themselves and filled our box with pencil cases within a week! Matt is not taking any clothes with him when he returns to Nepal next week- just a suitcase full of pencil cases. We are looking forward to hearing about how they will be used by our new friends in Nepal. What a fantastic idea – well done to all of you!